Hosted by Future Human, this was another of their lively evening discussion events with a panel of guest speakers. 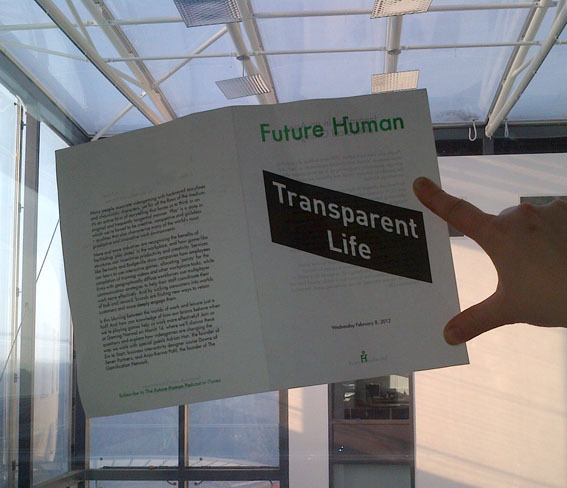 Themed ‘Transparent Life’, this salon focused on the blurring boundaries of augmented reality, real and artificial life and the dramatic changes and questions this imposes. Guest speaker included Keiichi Matsuda (film maker and designer), Callum RexReid (Digicave) and Luke Robert Mason (Philtor Phactory). We also got to hear about some completely different types of ‘Weavrs’!